Looking to lose weight but you’re not exactly sure where to begin? Well, if you’re a fan of TV’s The Biggest Loser, this spreadsheet is for you! Tackle your own Biggest Loser challenge and track your weight loss with this easy template. This Excel spreadsheet is available for free download here, so you can get started today! So how do you download and use the Biggest Loser spreadsheet? Similar to the Biggest Loser TV show, this spreadsheet is based around three major weigh-ins. To begin, you can enter your original weight as a baseline. 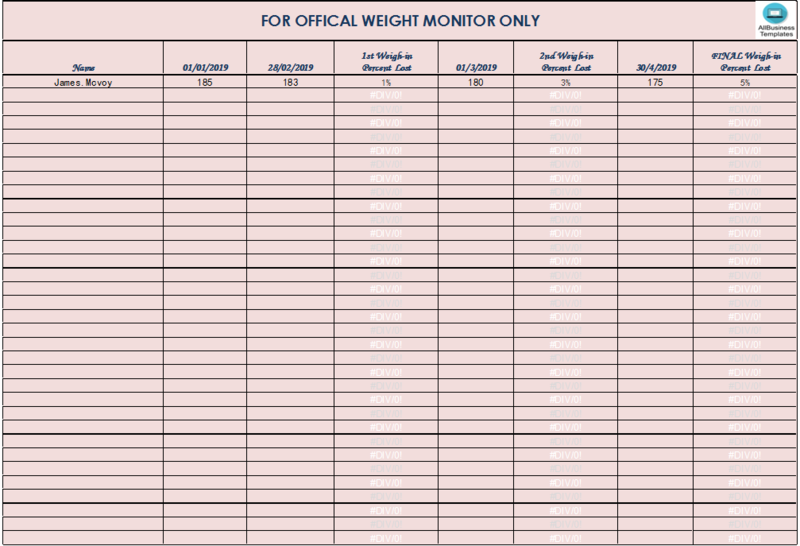 When you enter your weight after each weigh-in, this handy spreadsheet will tell you the percentage of your original weight that you have lost. You’ll be able to see your achievements throughout your weight loss journey, just like the contestants on The Biggest Loser. It’s obvious that you’re ready to take the first steps toward living a happier and healthier life. Losing weight not only does wonders for yourself in so many ways, it also benefits so many friends and loved ones around you. So what are you waiting for? Download this easy Biggest Loser weight loss spreadsheet and start shedding those extra pounds today! Remember, this spreadsheet is just one piece of the puzzle. It’s important to consult with a physician before beginning any type of weight loss regimen. Losing weight is easier with friends to support you, so be sure to post about this spreadsheet on Facebook and Twitter to encourage everyone you know to use it as well.